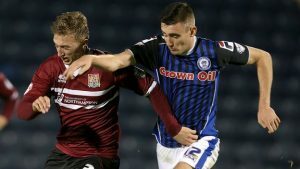 Although Rochdale had a man sent off in the second half, they managed to fend off Northampton to take then to top of League Two. A shot from inside the penalty area from Ian Henderson gave Dale the lead in the sixth minute of the game. However, things seemed to be looking up for Northampton after Matt Lund was sent off early in the second half, after giving Rochdale a 2-0 lead. Joe Bunney ensured that all 3 points were going to Rochdale as he fired home in the 65th minute. Northampton couldn’t find a way forward and the game ended 3-0 to Rochdale. Rochdale AFC are now top of League Two with only 9 games, outstanding if this form lasts the Dale might be playing League One football next season.